Free and open to the public; refreshments will be provided. 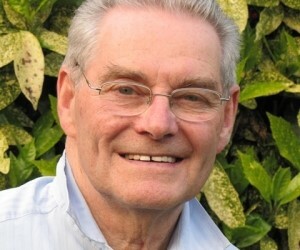 On a recent journey across Europe, Holocaust survivor Tomi Reichental witnessed a resurgence of the xenophobia and extreme nationalism that destroyed the world of his childhood and led to the death of 35 members of his family. 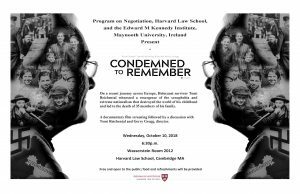 In the acclaimed documentary, Condemned to Remember, Reichental sees history repeating itself. 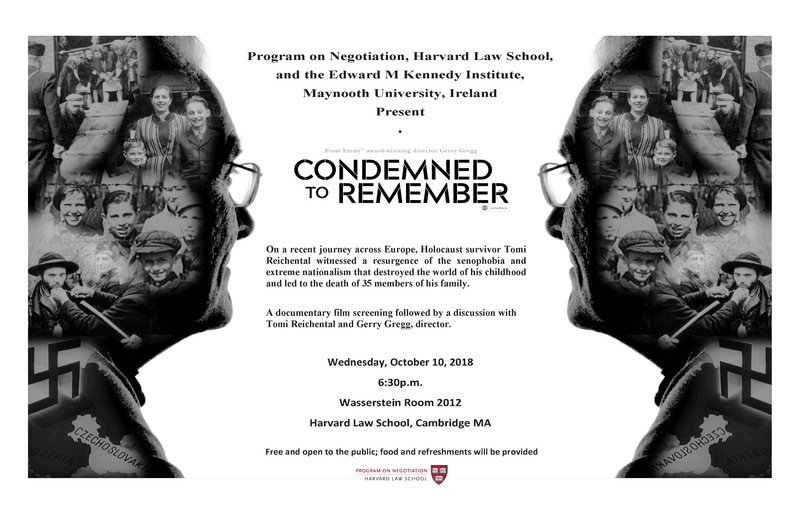 In the discussion afterwards, he and Emmy award – winning director Gerry Gregg will reflect on these fears, and the importance for societies to learn from the past and address these challenges today. 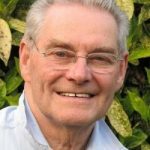 Tomi Reichental is a survivor of the notorious Bergen Belsen Concentration Camp where he was incarcerated in 1944 at the age of nine. Tomi travelled to Ireland in 1959 where he settled and raised a family. After 50 years he has broken his silence about his experiences of the Shoah. As one of the fading generation of survivors he believes he must bear witness on behalf of the victims. Since 2006 Tomi has spoken to over 100,000 students all over Ireland, written a best-selling memoir, and made a trilogy of documentaries. His remarkable “mission of remembrance” has prompted NUI Maynooth, Dublin City University and Trinity College to award him Honorary Degrees for his service to Irish Education and his tireless work to promote tolerance and pluralism throughout Irish society and beyond. Gerry Gregg has been making television programs, films and radio programs since joining RTE, the Irish State Broadcast organization, in 1978 as a 22 year old First Class Honours degree graduate from University College Dublin. 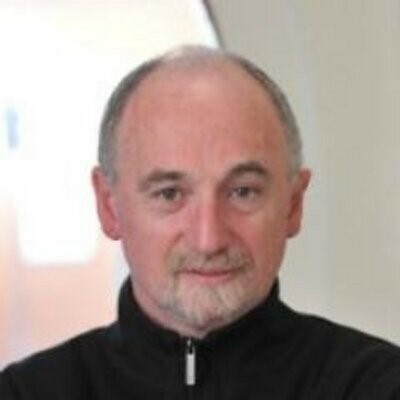 After eight years with the Public Service network as a Producer/Director, during which time he was at the heart of the pathbreaking “Today Tonight” Current Affairs team, Gerry left RTE in 1989 to set up his own production company. Since then he has established a reputation as one of Ireland’s most accomplished film-makers with a distinguished track record in current affairs, documentary and drama production.